Wells Fargo: Best for small business lending. Chase: Best for small business credit cards. Capital One: Best for high number of deposits and monthly transactions. Bank of America: Best for low-cost checking accounts. Azlo (from BBVA Compass): Best for digital, no-fee checking accounts. Citibank: Best for a range of checking options. Axos Bank: Best for interest-yielding checking and savings accounts. Live Oak Bank: Best for government-guaranteed SBA loans. 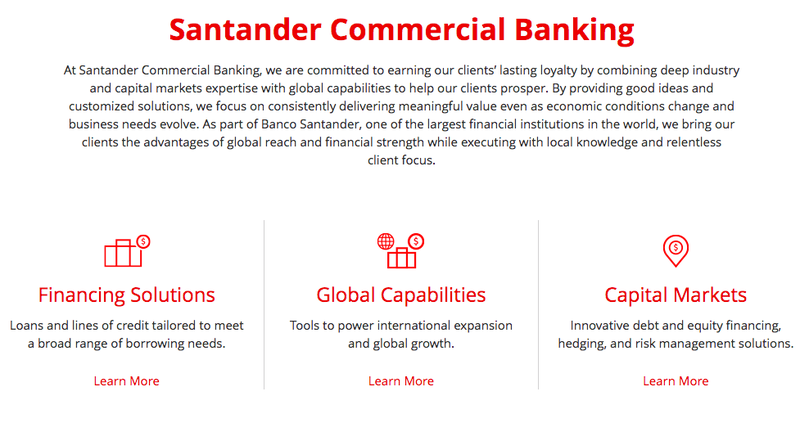 Santander Bank: Best for businesses that import or export products. TD Bank: Best for commercial real estate loans. Consumers Credit Union: Best credit union option. If you’re serious about running and growing your small business, you’ll want to set up a business bank account as soon as possible so you can start managing your finances (and, eventually, apply for small business loans). But when you start searching for a bank to work with, you’ll quickly realize that finding the right small business bank is easier said than done: It takes more than just knocking on the door of the bank nearest your business. It can be overwhelming to sort through the fine print on bank websites and really figure out if they can offer the products and services your business truly needs. Lucky for you, we’re here to do some of the heavy lifting for you—we’ve scoured the banking landscape and put together this definitive guide on small business banks. First, we’ll cover the 10 best banks for small businesses in 2019, and then tell you how to find the best bank for your company. Unlike most traditional banks, Wells Fargo offers more than just medium-term loans and lines of credit. They also offer short-term loans, SBA loans, and equipment finance, making their lending program incredibly flexible for small business owners. Depending on the type of loan you’re going for with Wells Fargo, your small business can secure anywhere from $10,000 to $100,000 in financing, at a starting interest rate of 6.75%. And because you’ll already have a business account open with the bank, your business loan application for any of the Wells Fargo small business loans will be fast and easy. Here’s why we think Wells Fargo lending really stands out: It’s the most active SBA lender in the United States. Just take a look at the numbers: In 2016 alone, Wells Fargo issued 6,587 loans from the SBA 7(a) loan program—lending a total of $1,363,161,100 to small businesses. 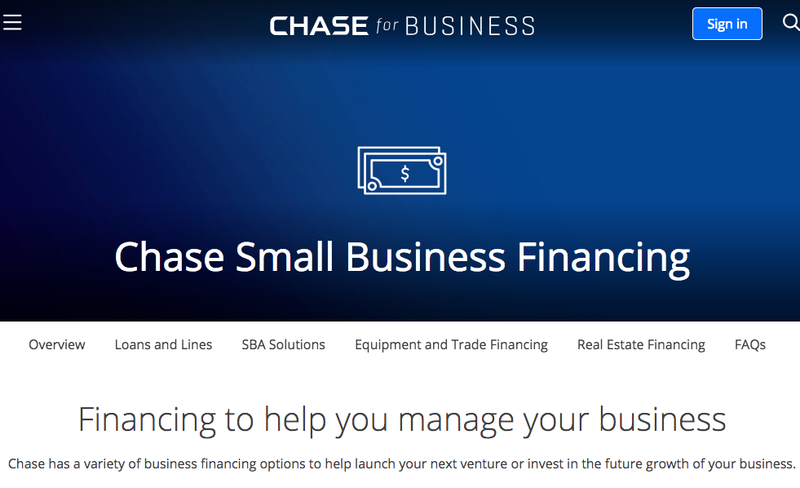 Chase offers a variety of loan options for small business owners, like term loans, lines of credit, SBA loans, commercial real estate loans, and equipment financing. While Chase is starting to offer more alternative lending products, it’s best known for those traditional small business loans. Your small business will absolutely benefit from the well-established Chase lending program and their several low-cost business checking accounts. But we think Chase really shines with their small business credit card. In particular, Chase offers some of the most substantial cash back and rewards points earnings on business credit cards. Although Capital One has substantial consumer and commercial banking programs, their comprehensive suite of financing solutions proves that they’re equally devoted to small business owners. 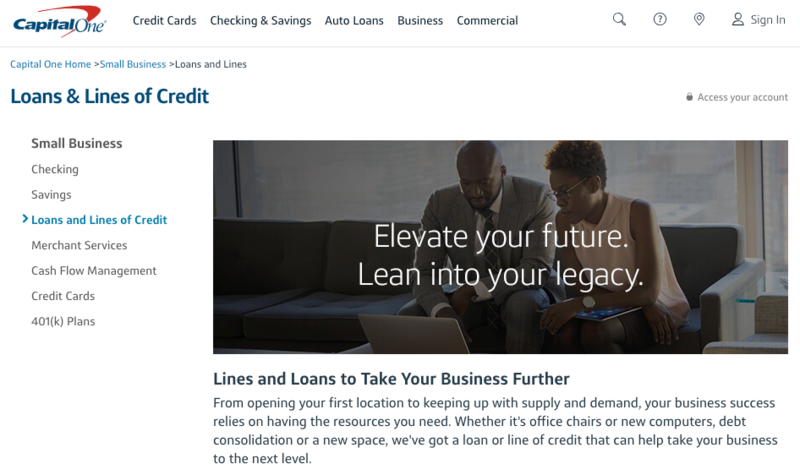 There are a variety of Capital One small business loan options: you could take out a working capital line of credit, equipment or business auto loan, business installment loan, or SBA loan from Capital One. With a wide variety of loan products available, they’re sure to meet any financing need that comes up as your business grows. Capital One truly prioritizes your banking relationship. If you have an established Capital One business account and apply for a loan with the bank, you might qualify for what Capital One calls “relationship-based” business loan rates. Simply put, Capital One might give you a lower-cost loan if you already have an established relationship with the bank. Capital One offers a straightforward small business checking account system. You have two Capital One business checking options to choose from: the Spark Business Basic Checking and the Spark Business Unlimited Checking. The Capital One Business Advantage Savings Account is a stellar choice for a first savings account for many businesses, too, which requires a minimum initial deposit of just $250. With a strong lending program and low-cost business checking accounts, Capital One is one of the best banks for small business. But Capital One really sets itself apart by being totally devoted to small businesses. No two small businesses are alike, and Capital One recognizes that by tailoring their Spark Business program to meet various banking needs across various industries. In their 200-year history, Bank of America has supported more than 3 million small business owners with easy-to-use banking products and services. With that much influence, Bank of America might just be the best bank for small business. Here’s why it could be a good fit for your small business. You won’t have to worry about a lack of small business lending capacity with Bank of America: The bank secured almost $10.7 billion in new credit to small business owners in 2015. Bank of America offers traditional bank financing, like secured business term loans and lines of credit, along with commercial real estate loans, equipment and vehicle financing, and SBA loans. And, as with any small business loans from major banks, you can get long-term financing at a low rate. 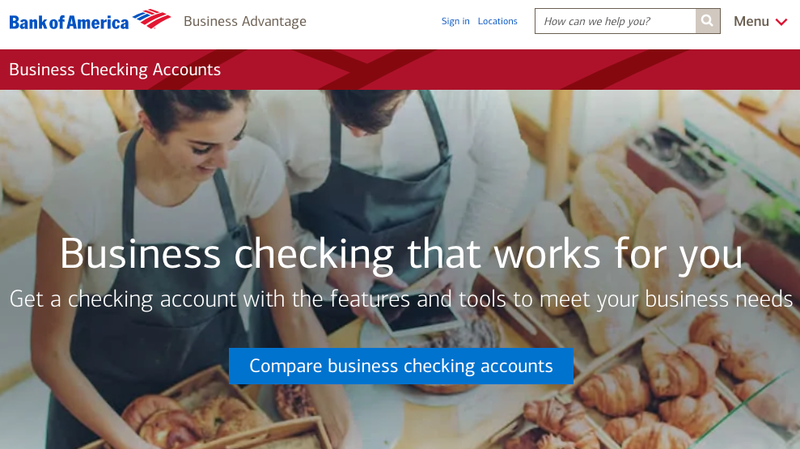 There are two solid Bank of America business checking account options for small business owners: the Business Fundamentals account and the Business Advantage account. If your small business mainly deals in cash, you’ll definitely want to consider a Bank of America business account—of the top four small business banks on this list, Bank of America charges the lowest fees on cash deposits. Clover Solutions, the bank’s advanced point of sale devices designed to cut down your workload and make your business work more efficiently. Clover products can help organize your payment processing, inventory management, and employee scheduling. As far as the best bank for small business goes, BoA is a tried-and-true banking option, with a solid Bank of America business lending program and intuitive checking accounts. And if you want to be absolutely sure that you’ll waive a checking account monthly fee, Bank of America is probably your best bet, since it offers the most ways to waive that extra charge. When you think about the best bank for small business, you’re probably thinking of the brick-and-mortar banks dotting your area. But with Azlo Business Checking, you don’t need to step foot into a traditional bank to have a positive banking experience. Created especially for freelancers, self-employed individuals, and side-hustlers, Azlo Business Checking stands out from the pack for two very obvious reasons: This bank account is completely digital, and it’s completely fee-free. 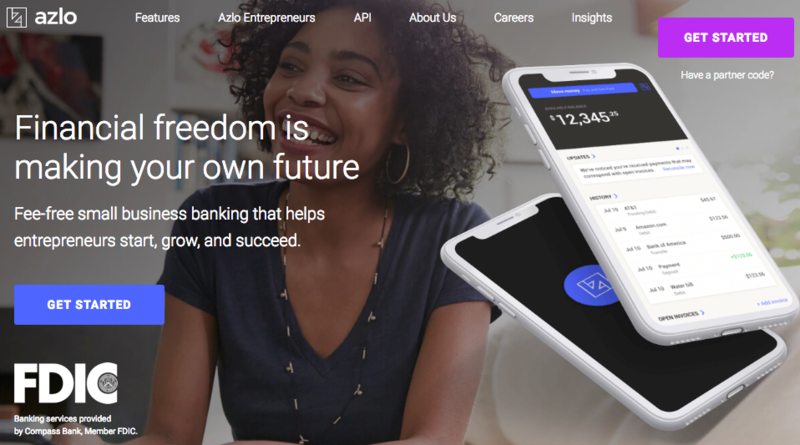 Azlo was launched with the backing with BBVA Compass Bank, which holds all accounts on this platform and ensures that all deposits are FDIC-insured. Since there are no fees and only one checking account tier involved, Azlo’s platform doesn’t come with the (admittedly complicated) fine print that some other checking account terms do. The model is super-simple: Without any minimum balance requirements or tier caps, Azlo offers users a free space to deposit, store, and transfer as much cash as they need. If it’s convenience that you’re seeking, then Azlo might be the perfect bank for your small business. Azlo offers a completely digital banking experience for small business owners. Some features, such as check deposit, that you could get with a physical bank are missing. Azlo’s target customer is the busy small business owner who needs to access their account online and handle transactions electronically. Citibank is concentrated in six urban centers of the United States: New York City, Washington, D.C., Chicago, Miami, Los Angeles, and San Francisco. That covers a wide net of small businesses, but even if you’re not located in one of those cities, there’s a lot you can accomplish with the bank’s digital footprint. 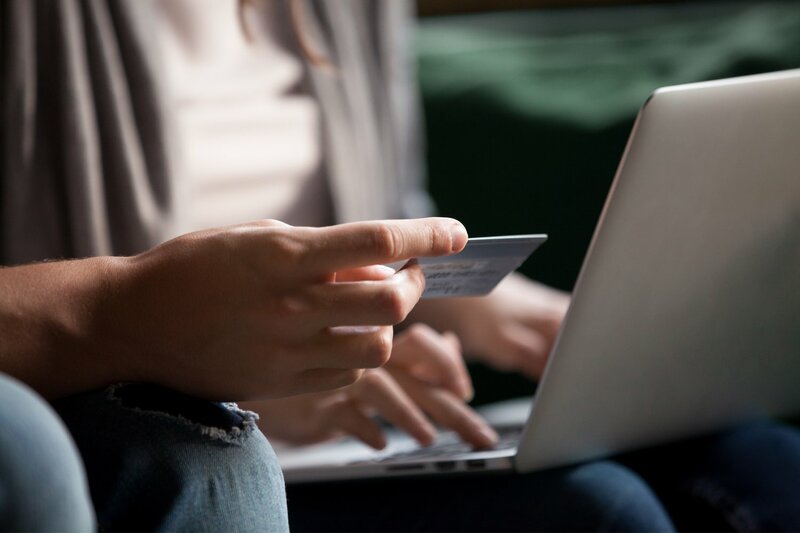 Although Citibank is best known for their credit cards, their checking accounts are what really stand out for small business owners. CitiBusiness Streamlined Checking Account: An entry-level checking account. Waive the monthly fee with a $5,000 minimum balance. CitiBusiness Flexible Checking Account: This checking account is perfect for fast-growing businesses. You get 500 free transactions per month, and you can avoid fees with a $10,000 minimum balance. CitiBusiness Checking Account: This account is good for medium-sized businesses and has an earnings credit to offset fees. CitiBusiness Interest Checking Account: Interest-bearing checking account for businesses that can maintain a $10,000 or higher average balance. With so many checking options, you’re almost guaranteed to find something that works for your small business. And you can stay with the same bank, upgrading to a different checking account as your company grows. Citibank also offers savings accounts, a money market account, and certificates of deposit. You can also use Citibank for business loans and business credit cards. For longer-term financing, Citibank offers commercial mortgages and installment loans, ideal for buying equipment or expanding operations. For shorter-term financing, there are two Citibank business credit cards. One is a business travel credit card that earns you American Airlines bonus miles for spending. The other is a card designed for Costco members. 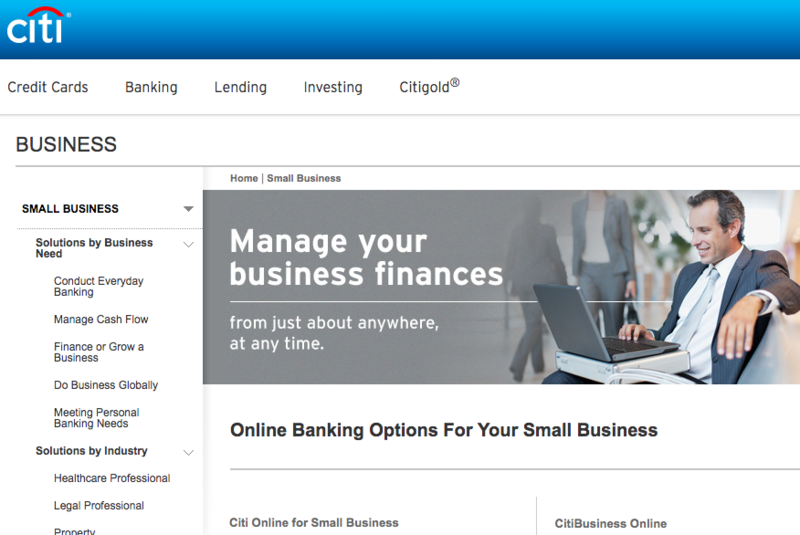 Citibank is one of the overall best banks for small business, with something to offer for nearly every type of company and every stage of growth. When just starting out, you can try Citibank’s travel business credit card for quick, convenient financing. As you grow, you might need a longer-term loan or merchant services account. And their four business checking accounts mean that your bank can stay the same even as your business evolves. Axos Bank is a digital bank that offers a range of consumer and small business solutions. From financing to checking accounts and savings accounts, Axos offers a suite of products that can help your small business. Axos tries to help small businesses grow, evidenced by their interest-bearing checking and savings options. It’s rare to get good terms on interest-yielding accounts, but Axos delivers. Axos offers three different checking accounts for small businesses. Their entry-level account, Analyzed Business Checking, requires just a $100 opening deposit and no average balance minimum. However, as your balance increases, you stand to receive an earnings credit each month to offset the $15 monthly maintenance fee. Their Basic Business Checking has no maintenance fees and a $1,000 average daily balance requirement. Axos’s best checking option, if you can maintain a $5,000 balance, is the Business Interest Checking account. You can earn up to 0.80% APY on your balance. The account also includes free online bill pay, up to 60 items of remote deposit, and unlimited domestic ATM fee reimbursements. Just like consumers, small business owners should put some money away for a rainy day. Axos Bank has multiple savings options to help you save for unexpected costs. Both the Business Savings and Business Money Market accounts require just a $1,000 opening deposit and can earn up to 0.80% APY. You do, however, need to maintain a minimum balance to avoid a monthly maintenance fee. For bigger savers, the Business Premium Savings account earns up to 1.06% APY and requires a $25,000 initial deposit (but no minimum balance requirements or monthly maintenance fees going forward). A certificate of deposit lets you put away money for a specific period of time, in exchange for higher interest yields. 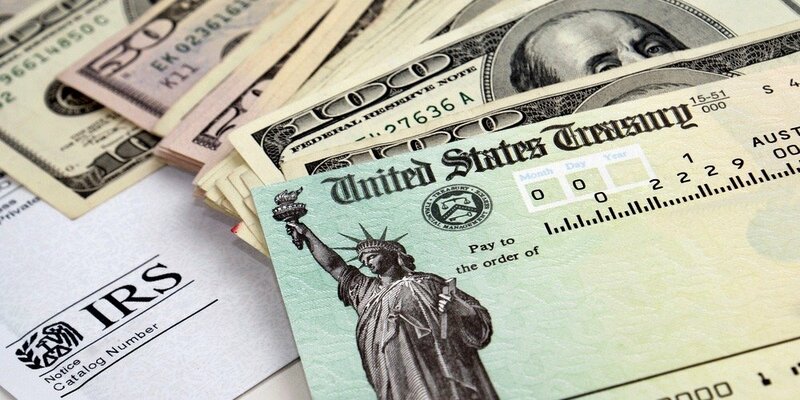 The catch is that you typically have to pay a penalty if you withdraw the money ahead of time. Axos Bank offers business CDs with yields of up to 1.35% for a 5-year CD. If you know you want to invest money for a longer period of time, consider an Axos CD. Small business owners in need of financing might be able to find just what they need at Axos Bank. Axos bank offers equipment financing, commercial real estate loans, invoice factoring, lines of credit, and term loans. The bank will assign you a dedicated account rep to help you find what you need, and their lending services are available online 24/7. Axos Bank is a good digital banking and lending option for small business owners. You can accomplish all tasks online or by speaking to an account rep on the phone. Your money will grow with Axos thanks to their interest-bearing checking and savings accounts. As a digital bank, Axos has fewer overhead costs than brick and mortar banks. As a result, they might be able to offer you a lower interest rate on loans and higher interest yield on accounts. Many small businesses aren’t familiar with Live Oak Bank because this bank has no physical branches. A completely digital bank, Live Oak offers both business and personal banking. On the business side, the bank focuses on SBA loans, certificates of deposit, and savings accounts. Although Live Oak Bank offers many different types of business loans, they have a great deal of success and experience with SBA loans. If you’re on the market for an SBA loan, this is definitely a bank that you should contact. Live Oak Bank is an SBA Preferred Lender, which means the SBA has granted them the authority to approve SBA loan applications on an expedited basis. Compared to other SBA lenders, going with Live Oak gives you a speed advantage. You also get the experience of bankers who have facilitated over $850 million in SBA funding. SBA 504 Green Loans: These loans fall under the 504 umbrella but provide more favorable terms for sustainable, green businesses. In addition to SBA loans, Live Oak has also helped small businesses with other government small business loans, such as USDA business loans. Live Oak also provides certificates of deposit and savings accounts for small business customers. The Business Online Savings Account is a high-yield account, currently at a 1.09% interest rate, which you can open and manage online. The yield, according to Live Oak, is 12 times higher than the national average. There are no monthly maintenance fees. Certificate of deposit rates currently range from 2.45% to 3.15%, depending on how long you keep your money locked in. Live Oak Bank is a great option for small business loans, certificates of deposit, and savings accounts. You can get started online, and the bank has a team of industry and banking experts to help you accomplish your company’s financial goals. If you are looking for a checking account, you’ll need to go elsewhere for that, as Live Oak currently doesn’t offer checking accounts. However, with a commitment to service and technology, Live Oak is definitely one of the best banks for small business in 2019. Santander Bank is an FDIC-insured bank with branches and clients located mostly in the northeast. This bank often appears in the news in connection with equity financing, hedge funds, and risk management solutions. Indeed, this is one of the largest banks in the world, with over $13 billion in assets. They have branches in dozens of countries, including the United States, Brazil, Spain, Germany, and Mexico. With over 100 million customers and 14,400 branches, this is one of the best banks for small business if you transact business internationally. If your business does transactions in multiple countries, then you already appreciate the challenge of working with the regulations and currencies of different nations. Santander Bank can make things easier for you with services designed to protect against currency volatility. For example, Santander has trading desks in all major financial markets throughout the world, helping you get the most competitive exchange rates. Santander commercial customers can send payment via bank drafts for international customers. The payments will be deposited directly into the customer’s overseas bank account. In addition, you can present checks for deposit whether they are in USD or another currency. 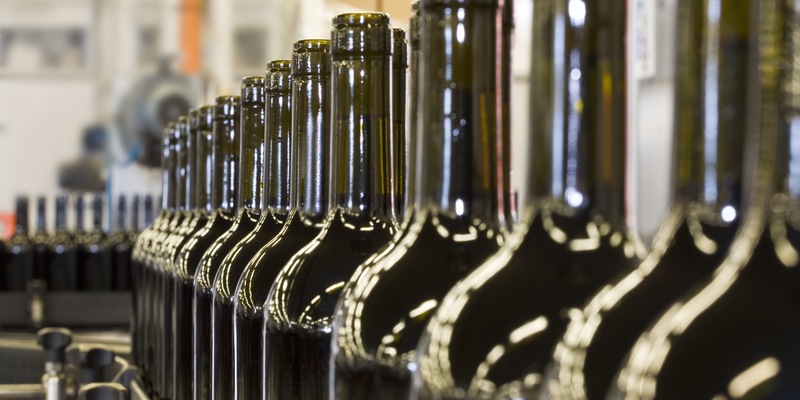 Santander Bank also offers a range of solutions for businesses that trade overseas. The services are designed to help your company minimize risk, increase working capital, and negotiate more favorable contract terms. For exporters, Santander Bank can help you obtain letters of credit from overseas customers. Santander will even work with your buyer’s international bank to ensure payment winds up in your account before your payment deadline. They also with the U.S. Export-Import Bank and the SBA on SBA export loans to help you expand your export business and fulfill orders. For importers, Santander will issue letters of credit on your behalf to increase the confidence of sellers in current and untapped markets. They’ll also offer banker’s acceptances, which are similar to short-term import business loans. These allow you to defer payments to sellers or break them into installments. Businesses that have stepped onto the world stage have unique challenges, and you need a bank equipped to handle these. Santander has a presence in multiple countries and their staff have the experience of working with importers and exporters. Just keep in mind that the bank has branches only in the Northeast. Whether it’s something as simple as getting the best rate on currency exchange or a complicated import/export transaction with multiple buyers and sellers, Santander has you covered. This makes Santander one of the best banks for small business in 2019. TD Bank, like Santander Bank, has branches across the East Coast. This bank has a diverse range of solutions for small business owners, including checking accounts, savings accounts, credit cards, merchant services, and business loans. However, they really stand out because they provide a lot of opportunities for business owners who want to purchase, upgrade, or invest in commercial real estate. Bridge Loans: These loans can help you transition from short-term, hard money loans to longer-term bank financing. A variety of business customers are eligible for these loans. Whether you’re a new fix and flipper or an experienced real estate developer, TD Bank likely has a commercial real estate solution that’s right for you. And for other business needs, TD offers other types of business loans. 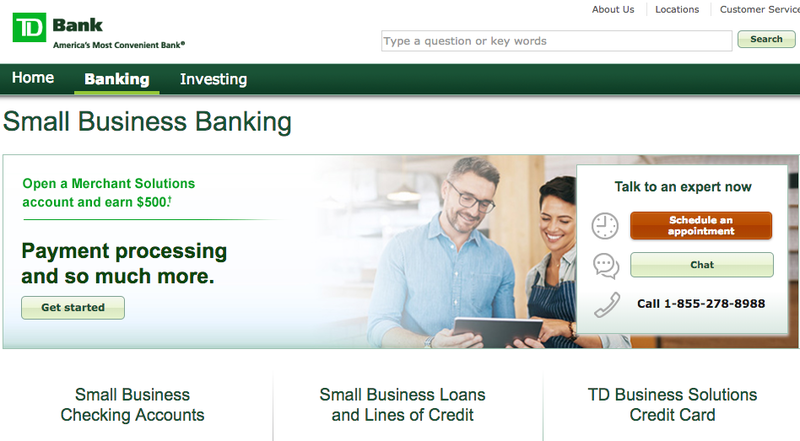 In addition to loans, TD Bank offers other small business banking services. For example, there are TD Bank business checking accounts, with low, waivable monthly maintenance fees. Their entry-level checking account comes with a $10 monthly maintenance fee. Depending on the checking account that you choose, you get up to $30,000 in free monthly cash deposits and up to 500 free monthly transactions. TD Bank has a full-service bank perfect for businesses located on the East Coast. If you don’t transact in cash, it could be a good bank for you even if you’re not on the East Coast. But you’ll probably want a branch near you, especially if your goal is to have one bank for all your business needs. You can use TD Bank for your checking account, savings account, merchant services, and business loans. The multitude of options makes TD Bank a strong contender among the best banks for small business. Credit unions have many of the same financial offerings as banks, but their structure is slightly different. Credit unions are member-owned and operated, and their products are available only to members. Credit unions are often a good choice for business owners because their products come with lower fees, higher interest yield, and better service. Although the name of this credit union might suggest otherwise, this credit union is not just for personal banking. In fact, Consumers Credit Union provides a range of both personal and business banking services. Plus, Consumers Credit Union is easy to join. To join this credit union, you simply have to pay a $5 membership fee and open a savings account with a minimum deposit of $5. 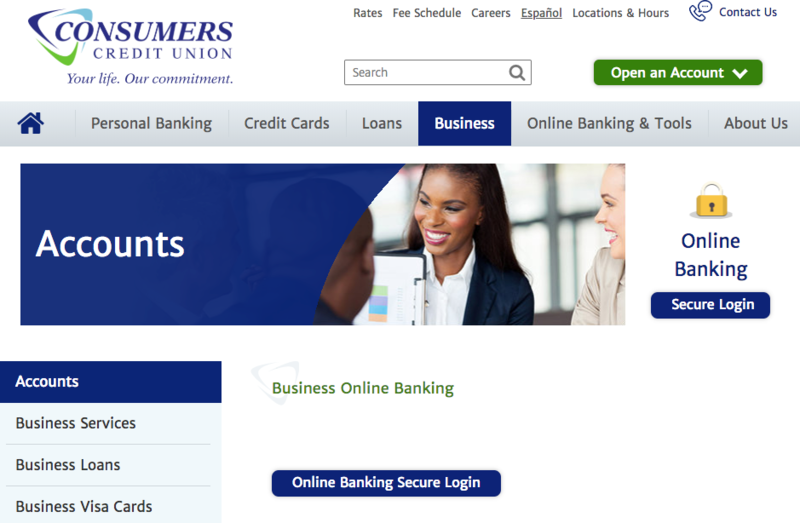 Consumers Credit Union offers checking and savings accounts for small businesses. Even the entry-level checking account waives the monthly $15 maintenance fee as long as you maintain a $1,000 minimum deposit. And you can open an interest-bearing savings account with as little as $5 (though you have to deposit at least $100 to avoid a monthly fee). There are also a variety of loan options available through Consumers Credit Union. These include owner-occupied and investment property commercial real estate loans, equipment loans, and lines of credit. There are also secured personal loans that you can use for business purposes. 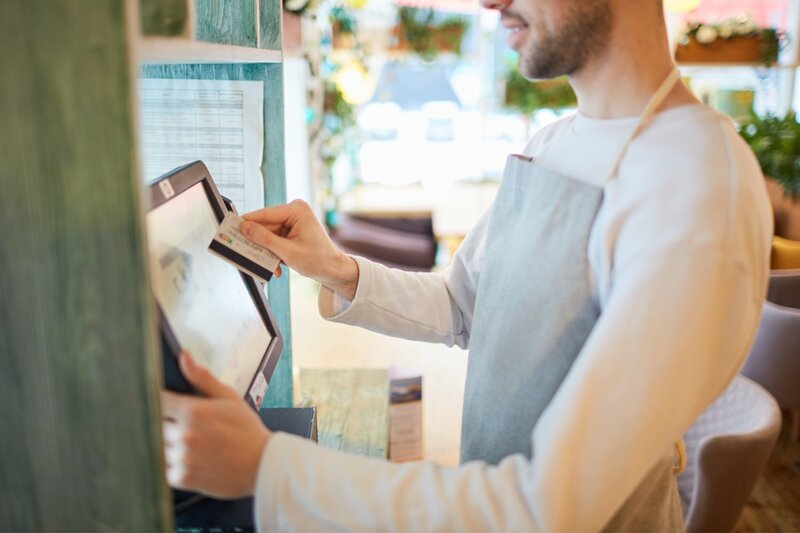 Consumers Credit Union offers a Visa credit card and Visa debit card for small business owners, perfect for separating your business from personal finances or for authorizing employee purchases. Individualized credit limits are available for different cards, so these can be used by you and your entire team. If you get their debit card, you can access ATMs in the credit union’s nationwide network at no cost. If you’ve entrusted your money at bank all your life, it can be difficult to switch to a credit union. But many who’ve made the switch are pleasantly surprised with lower fees, higher interest yields, more affordable loans, and better customer service. The main hurdle is the eligibility to join a credit union. Fortunately, Consumers Credit Union requires just a one-time $5 fee and a $5 opening savings deposit to become a member. At last count, there were 4,746 commercial banks in the United States. with physical branches. That doesn’t even include the dozens of online banks with a completely digital presence. That’s a lot of banks to sort through to find the one that works for your small business. Are you okay with paying monthly fees to access certain value-added services (such as more included transactions)? Do you prefer to do all your banking at one bank, or are you okay with using different banks for different products? When you’re answering these questions, be sure to have both your business’s current situation and future goals in mind. If you stay realistic and upfront with your banking needs, you’ll know exactly how to sort through the fine print and find the right small business bank for your company. The Blue Business Plus from Amex is our favorite 0% intro APR period business credit card on the market. Why? The intro APR period is 12 months long. Keep in mind, though, that after your 15 interest-free months are up, a variable APR sets in at a rate depending on your creditworthiness. This rate will also vary with the market, so check the issuer’s terms and conditions for the latest APR information. Chase’s Ink Business Preferred business credit card is hands-down the best travel card on the market right now thanks to their stellar signup bonus: You can earn 80,000 points after spending $5,000 in the first three months. If you use Chase cards for your personal spending, too, this card is even more powerful. The good news is that small business owners have a lot of options in 2019 about where to bank. The bad news is that all those choices might make it harder to narrow things down and figure out what works best for your company. Fortunately, your choice doesn’t need to be a permanent one. If you’re unhappy with rates or the customer service at your current bank, it might be time for a change. Try one of the 10 best banks for small business listed above. It might be just the thing to help your business grow to the next level.